Receiving faint light which has travelled 11 billion years is tough work. 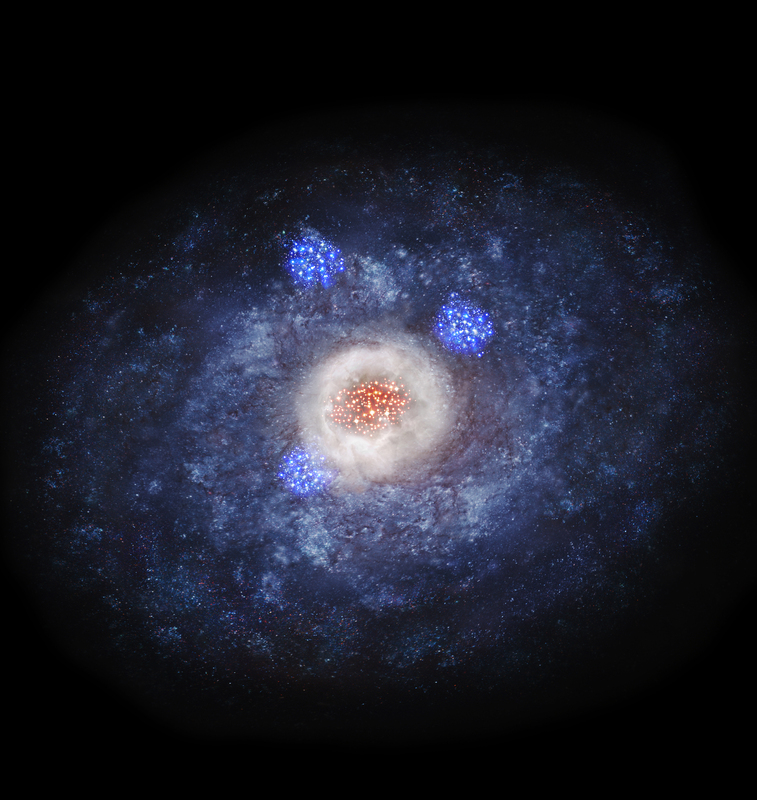 The team harnessed the power of three telescopes to anatomize the ancient galaxies. First, they used NAOJ’s 8.2-m Subaru Telescope in Hawai`i and picked out 25 galaxies in this epoch. Then they targeted the galaxies for observations with NASA/ESA’s Hubble Space Telescope (HST) and the Atacama Large Millimeter/submillimeter Array (ALMA). The astronomers used HST to capture the light from stars which tells us the “current” (as of when the light was emitted, 11 billion years ago) shape of the galaxies, while ALMA observed submillimeter waves from cold clouds of gas and dust, where new stars are being formed. By combining the two, we know the shapes of the galaxies 11 billion years ago and how they are evolving. 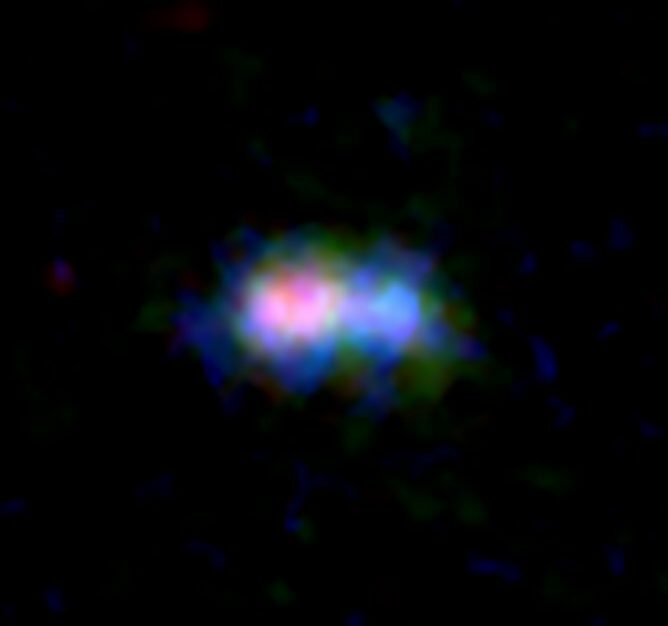 Observation images of a galaxy 11 billion light-years away. Submillimeter waves detected with ALMA are shown in left, indicating the location of dense dust and gas where stars are being formed. Optical and infrared light seen with the Hubble Space Telescope are shown in the middle and right, respectively. A large galactic disk is seen in infrared, while three young star clusters are seen in optical light. 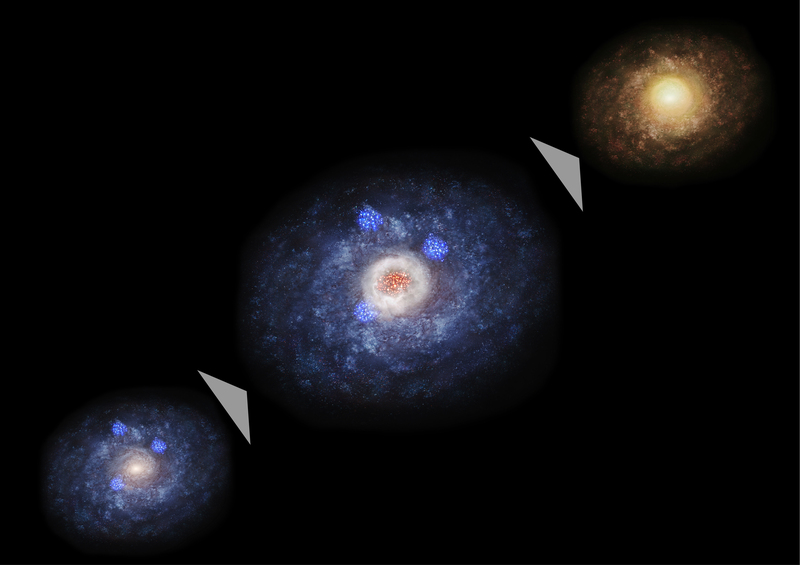 Evolution diagram of a galaxy. First the galaxy is dominated by the disk component (left) but active star formation occurs in the huge dust and gas cloud at the center of the galaxy (center). Then the galaxy is dominated by the stellar bulge and becomes an elliptical or lenticular galaxy. These observation results were published as Tadaki et al. “Bulge-forming Galaxies with an Extended Rotating Disk at z ~ 2” in the Astrophysical Journal in January 2017 and Tadaki et al. “Rotating Starburst Cores in Massive Galaxies at z = 2.5” in the Astrophysical Journal Letters in May 2017. This research was supported by the Japan Society for the Promotion of Science and the German Academic Exchange Service under the Japan-German Research Cooperative Program.